With 40 million caregivers now working around the country and given our rapidly aging population, in-home care services are set to skyrocket. For busy family members, it’s a difficult and emotional decision to decide how our elders should be cared for as they age. In order to give them the dignity and attention they deserve, care services can provide endless benefits to our aging friends and family. For those who are on the receiving end of care, it can be a struggle to admit they need help to perform some of the basic day-to-day tasks that used to be easy. Asking for help is hard enough. Building a relationship with someone who you will grow to depend on for their care services it another thing entirely. Here are 7 reasons why in-home care offers the best care services for your loved ones. When you register for nursing home care, you’ll be surprised how all of your incidentals and extras add up. You might suffer sticker shock when you see all of the extra fees your loved one will be receiving. A personal caregiver can be much cheaper while offering the personalized care that your loved one needs. Overall, you’ll see that it costs much less to pay for in-home care by the hour than round the clock costs at an elder care home. Look for a home care company that offers care services at a reasonable rate. With simple pricing models, easy to understand fee schedules, and the option for monthly or annual contracts, you’ll be surprised at how much you’ll save. All the while, you’ll be getting personalized treatment with the dignity anyone deserves. The added distress of uprooting their life can cause undue strain for elderly family members. If they have high blood pressure or PTSD issues, they can be triggered by the sudden change in environment. For family members who’ve recently had surgery or a major medical issue, being at home can speed up their recovery. Doctors and therapists agree that rehabilitation in a familiar environment, with the support of family and friends, is the ideal situation for recovery. In-home care services that give this option yield the best results for older people. There’s nothing more exhausting than when, after you’ve given the nurse your whole story, the doctor walks into the exam room and asks, “So, what’s wrong?” Having to give your story over and over makes the situation feel impersonal and uncomfortable. Working with an in-home care specialist who gets to know the things they like and all of their quirks will build a much stronger relationship. This will lead to a faster recovery and make loved ones feel better about their situation. Any type of care has an element of personal privacy and intimacy. Knowing that you have someone’s full attention during the length of your care can make the whole interaction much more positive for older people in recovery. There are well-documented cases of people in assisted living facilities suffering from severe bouts of depression. This can be caused by the shock of being disconnected from familiar surroundings or the disconnection from friends and neighbors. That feeling of disconnection is only exacerbated when facilities are in another city or a hard-to-reach area of town. It’s less likely that their other elderly neighbors and long-time friends will be able to make the trek to see them. In-home care services allow for our loved ones to live by their own rules, rather than the rules of a care facility. That autonomy and control are important to recovery. Ask around to a group of older people and they’ll rate the fear of having to live in a care facility as a deeper fear than death itself. This is because, as Americans, we value independence and autonomy in our daily lives. Our homes are our dominions and to have to live by other rules with people who we didn’t choose to live with makes us feel like children. Despite whatever events and activities are planned at a care facility, we know that most residents aren’t given much of a choice. Either they sit and watch TV or they take the bus to the mall. This lack of independence and confidence will destroy the spirit that older people need to make a strong recovery. In-home care services avoid those pitfalls. Strong family ties are what older people live for. Ask any group of older Americans and they’ll rave about wanting to see their grandchildren grow up and accomplish great things. They want to see this or that family member get married or finish school. Keeping the family together will also reduce those feelings of guilt that younger members will have when they sign their loved ones into a care facility. They’ll be able to also enjoy that familiar setting of where you have had great holiday or family celebrations. This also means you can drop in to visit whenever you want, instead of having to abide by a care facility’s schedule. Just be sure to call ahead so as not to disturb anyone in recovery. When you bring a caregiver on, you’ll have the option to interview them as much as you’d like. If you hire a friend or family member to perform in-home care services, that’s even better. That trust and the ability to call just one person to find out any information you need is priceless when dealing with the fragility of elder care. With your own responsibilities at home and in your life, you can focus on your needs knowing your family member is being taken care of. If you’re looking to find the best option with the most flexibility, in-home care is the answer for older people and people with disabilities. 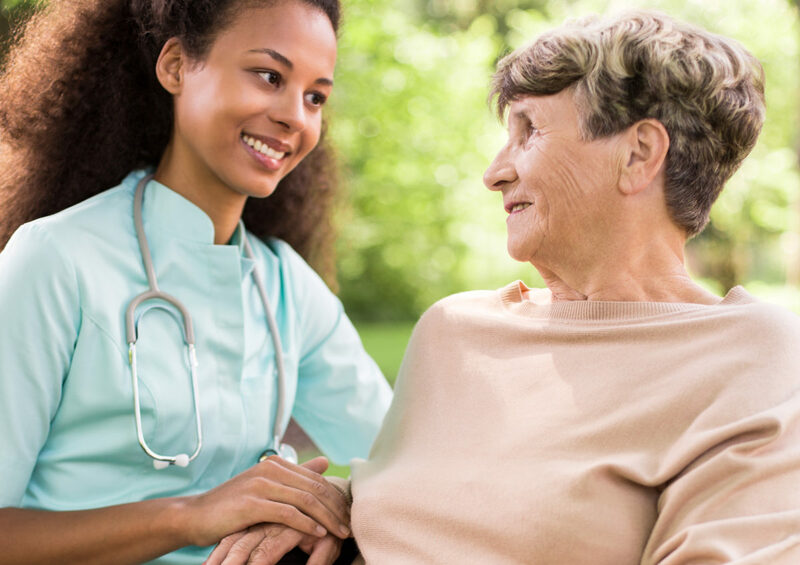 The person receiving the care will also appreciate the ability to forge a personal connection, rather than the cold administrative relationship offered by nursing homes. If you’re still trying to figure out who would be the best person to care for your family member, contact us for more tips.